The toughest challenge for a costumed billionaire crimefighter isn't so much protecting Gotham City from an endless parade of murderous psychopaths, it's trying to keep his own baby boy from becoming one of those very murderous psychopaths. Batman vs. Robin, a dynamic, triumphant sequel to last year's Son of Batman, continues the coming of age story of the ferocious Damian Wayne (Stuart Allan), 10 year old heir to both the Wayne family fortune and the legacy of Ra's al-Ghul, and the new Robin the Boy Wonder. Since accepting the mantle of Robin, Damian, an arrogant, dangerous, conflicted soul, hasn't had an easy time adapting to his father's brand of justice. "Justice, not vengeance," is the Batman's meme-ready mantra, which he finds drilled in his head and ringing in his ears when he single-handedly uncovers a child kidnapping and mutilation ring and captures a ghastly rouge called the Dollmaker (voiced by Weird Al Yankovic!) Robin stays his hand and his razor sharp batarang from the killing stroke, only to find the Dollmaker sanctioned by a new bird-themed costumed killer in town - the Talon (Jeremy Sisto). Batman vs. Robin loosely adapts the blockbuster "Court of Owls" storyline from the best selling The New 52 Batman comic series by the dynamic duo of Scott Snyder and Greg Capullo. The most intriguing and successful new addition to the Batman mythos, the Court of Owls are a centuries old secret society nested firmly in Gotham comprised of its wealthiest and most prominent citizens, all of whom, men, women and children, wear pallid owl masks, even when dining or conducting cryogenic experiments in their underground labs. The Court are a legend; thought to merely be a nursery rhyme used to scare young children, but they are in fact very real -- and have been secretly controlling Gotham's fate since the city was raised. It seems Bruce Wayne (Jason O'Mara) is the only wealthy son of Gotham who'd been unaware the Court actually existed before now, when the Court kidnaps him and finally offers him a mask of his own, not suspecting Wayne prefers bat masks to bird masks. Wayne plants a tracking device in the mask to later locate the Court's nest, but it really doesn't seem necessary -- if you want to find the Court of Owls, you can start by scoping out the sinister mansion on the outskirts of Gotham with the owl statues all over it. 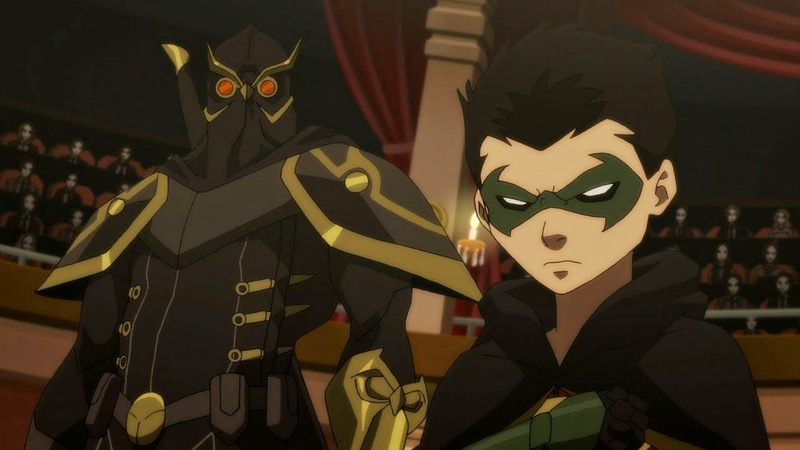 Little does Wayne suspect the Talon, one of the Court's private army of assassins, has plans to steal his son Damian away and recruit him as his own sidekick, since, you know, the kid's both an amazing warrior and already dressed like a bird. The Talon sees a lot of himself in Damian; all the best assassins have daddy issues, and the Talon explains he himself was once apprentice to a master thief, his father, whom he didn't see eye to eye with. The Talon also balks at the Court's plan to kill and then cryogenically freeze him, ready to be resurrected at their whim to do their killing. Can't blame Talon there. After Batman is overwhelmed and nearly killed by the Court of Owls and Robin ultimately rejects his offer to become the less catchy team of Talon and Robin, the Talon decides to go on a rampage and massacres the mighty Court himself. This would seem to solve Batman's Owl problems, but Talon unleashes an even bigger one when he releases the dozens of other Talon assassins on an assault on Wayne Manor and the Batcave. This rousing sequence is straight out of the comics (though smaller in scope than the all-out attack on Gotham that utilized the entire Bat family of characters). Batman, Alfred, and Nightwing (Sean Maher) engage in a brutal battle against the Talons where Batman dons a giant suit of Bat armor that would make Tony Stark call his lawyers. 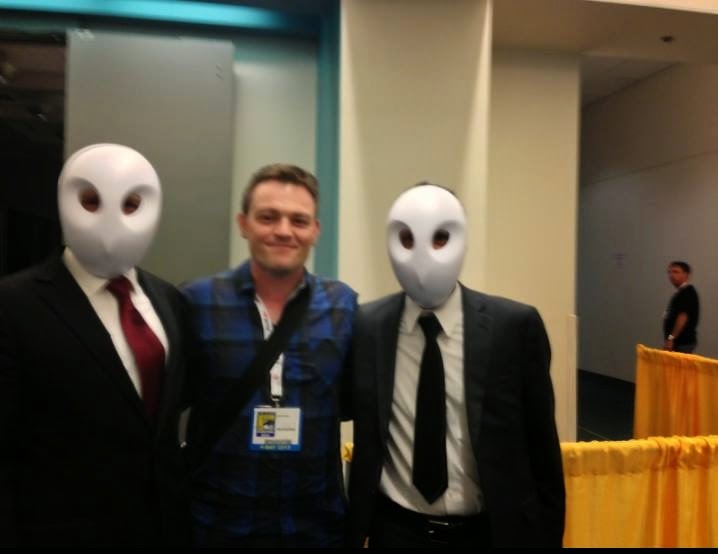 I, too, am a member of the Court of Owls.